On Saturday, February 24, 2018, we are hosting our 3rd annual L.O.V.E. 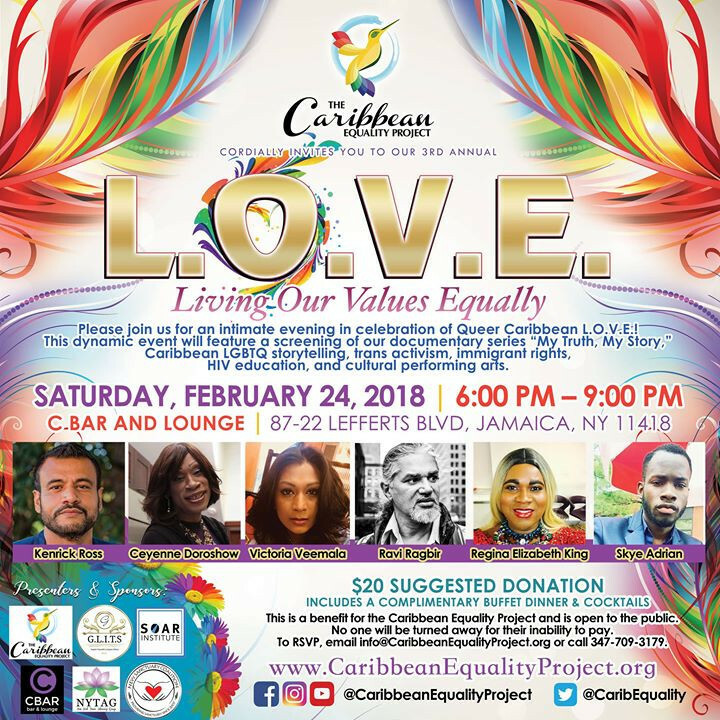 : Living Our Values Equally, a celebration of Queer Caribbean love at C Bar and Lounge from 6pm-9pm. Please join us for an intimate screening of the newest installment of our storytelling documentary series âMy Truth, My Story,â showcasing the inspirational journey of Guyanese Trans-Advocate and Entrepreneur, Victoria Veemala and a showing of "Remember Music," a short film reflecting on Muslim Americans in the aftermath of Pulse in Orlando, by Kenrick Ross. This dynamic event will also feature a special presentation by NYC immigrant rights leader, Ravi Ragbir, LGBTQ Caribbean storytelling, HIV activism, Trans education, and culturally diverse performing arts, followed by a panel discussion with our esteemed speakers. Skye O'neal Adrian, Youth Organizer at FIERCE! All proceeds benefit the Caribbean Equality Project. No one will be turned away for inability to pay. All donations are deductible to the fullest extent allowed by law. In our country's current political climate, we here at CEP believe it is continuously vital to share the colorful stories of our LGBTQ Caribbean immigrant brothers and sisters. Doing so inspires our community, educates our allies and unites us in our collective struggle for true equality and liberation. This is part of CEP's My Truth, My Story empowerment, diversity, cultural, and intimate conversation series, with a special focus on healing and healthy relationships with oneself, our partners, and our families. To RSVP, email [email protected] or call (347) 709-3179. To learn more about the Caribbean Equality Project & for regular updates, please visit www.CaribbeanEqualityProject.org or connect with us on Twitter @CaribEquality, and Facebook and Instagram at @CaribbeanEqualityProject.